Anyone Can Play Quarterback at Oregon! I read a column recently which made me wonder if the writer has ever heard of Oregon football. Upon further research, I discovered the author is a University of Arizona graduate, which explains a great deal. Still, if you are going to write about college football, specifically on a topic that everyone in the country is aware of, how can you not include Oregon? While I am not sure if there is any importance to the teams noted first and last, here are the teams mentioned in the article, in order of appearance: Alabama, Florida State, Georgia, LSU, Michigan, Notre Dame, Ohio State, Oklahoma, Texas and UCLA. Taylor Alie is one of several quarterbacks battling in spring practice to replace Marcus Mariota. Of the four teams that played in the first-ever College Football Playoff, two have “quarterback battles” due to losing starters at the position (Alabama and Florida State), and one has intrigue at the position due to everybody returning (Ohio State). But supposedly Oregon has no such important quarterback story line heading into the 2015 season? Florida State loses its Heisman Trophy-winning quarterback, as does Oregon, but apparently only the former has a competition worth noting. Is it really important who Ohio State starts at quarterback, when all three players could start for most Power Five teams? Joining Ohio State on the author’s list of teams that did not even lose their starting quarterbacks from 2014 are LSU, Notre Dame, Oklahoma and Texas. Oh, and I guess UCLA losing Brett Hundley as a starter and the subsequent battle to replace him is far more important than Oregon losing the man who beat him out for First Team All Pac-12, Marcus Mariota. 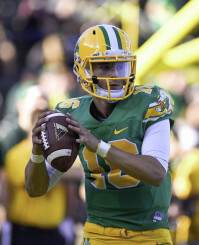 Even if the author wanted to qualify Oregon’s competition with a “wait until Vernon Adams arrives,” there is no denying that replacing the reigning Heisman winner and three-year starter on a team that just reached the national championship game is certainly one of the most interesting position battles in the country heading into the coming season. To put in bluntly, Oregon lost the best quarterback in the nation last year. What happens in the upcoming spring game and into fall camp at its quarterback position is most definitely “important” on a national scale. 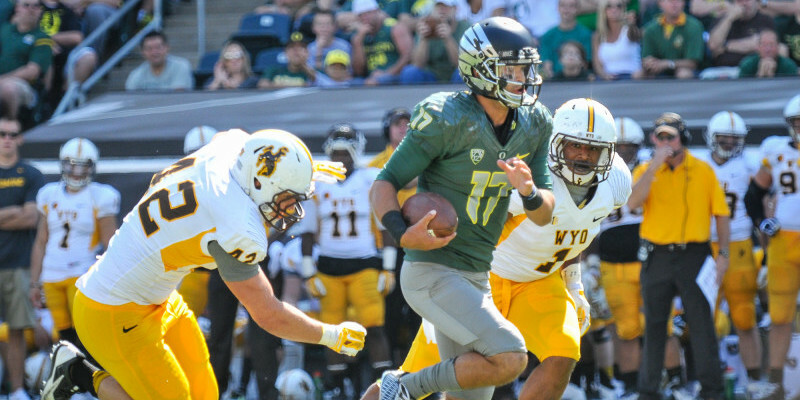 Morgan Mahalak hopes to be the starting quarterback for the Oregon Ducks in 2015. These points, and others that will not be repeated here, consisted of my initial reaction to the column. Then I decided to take the column as a backhanded compliment along the lines of the title to this article: Anyone can play quarterback at Oregon! Oregon has been so successful during the Chip Kelly and Mark Helfrich eras with a variety of quarterbacks. 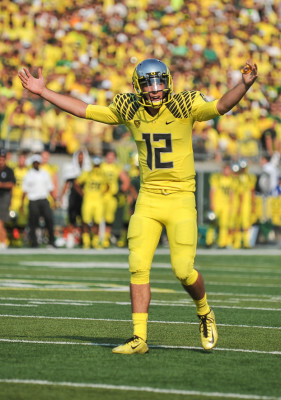 This particular writer has already determined the Ducks will once again be one of the elite teams in the country, regardless of who is selected as the starter and heir to Mariota’s throne. A core issue here may be that the writer has an anti-Ducks sentiment and simply does not want to give Oregon any publicity. But even though it may be inadvertent, his article does suggest one point Oregon fans could heartily agree with –there is excellence in the Ducks program.